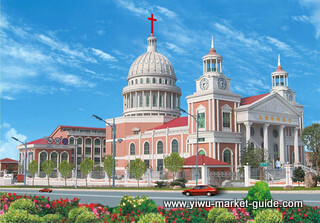 Yiwu St. Joseph Catholic Church is located in Yiwu city, Zhejiang province, China, which is famous for the international trade city. St. Joseph Church started from June, 14th, 2008. It is affiliated to Hangzhou diocese.Yiwu Church has its members around 500, 90% of them are from China. There are 10% members come from all over the world like Europe,North America, Africa and the Middle East etc. The God day Mass is at 8:00PM every Sunday (in Chinese),besides, there has English Mass on Saturdays started from Oct., 10th, 2009. Yiwu Islam history is actually very short, only after 1980s, as the market was built up, more and more Muslims came in. 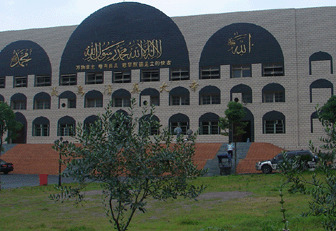 In 2000, the number of foreign Muslims in Yiwu reached 260. They had 2 temporary sits. One in a restaurant in Bingwang road, the other one was Red House Hotel. In 2001, with the development of the market in Yiwu, trading company set up by Muslim countries reached more than 20. In the same year, the Provincial Ethnic and Religious Affairs Commission approved the first place for Islam in the temporary activities – Red House Hotel. 2002 Spring Canton Fair, the number of poly Boxing Day has reached 500 people, the Red House Hotel’s premises was only 150 square meters, and there is a big security risk. Municipal government attaches great importance to the original place in the Red House Hotel successfully relocated to the south gate Street 200, second floor, with an area of about 500 square meters. In the same year in September, to ensure that the majority of foreign Muslims in Yiwu have a good religious life, according to actual needs, the city of Yiwu City Bureau of Religious Affairs approved the establishment of Islamic places of temporary management committee. October 2003, the Canton Fair, Yiwu Fair during the Friday Prayers number has increased to more than 1,500 people, at that time, “the Beijing Youth Daily”, “Global Times”, “China Today” and so with a larger coverage and presentation of business life in Yiwu, Yiwu, Muslim and “Arab village.” Major domestic websites have also reproduced the reports at home and abroad. April 2004, during the trade fair, South Gate Street, another place where overcrowding has reached more than 2,000 people, the municipal government attaches great importance, they began to find the right place. In the same year in August, venues moved to No. 90, Riverside Road from the south gate Street. The new place covers an area of about 20 acres, the hall area venues 3000 square meters. 2005 to 2006, to Yiwu faster growth and foreign Muslims, every Friday, about 5,000 people gather ceremony. About 20,000 Muslims businessmen living in Yiwu. To April 2007, the number of prayers on poly Boxing Day reached 7,000. Yiwu foreign Muslims are mostly from Yemen, Saudi Arabia, UAE, Iraq, Kuwait, Palestine, Iran, Lebanon, Syria, Jordan, Libya, Egypt, Algeria, Mauritania, Mali, Tunisia, Morocco, Sudan, Pakistan , Afghanistan, India, and Malaysia.